Today is the first day of Stash Dash!! For those of you who don't know what Stash Dash is, it's an annual event hosted by The Knit Girllls where, for the next few months, you make a virtual dash to use up as much as your stash as possible and/or finishing some WIPs. You're allowed to knit, crochet, weave, and spin (I believe there are other crafts you can do, but these are the only ones I know of at the top of my head) and there are several different levels that you can participate in, from 3k (that's 3000 metres or 3280 yards) to 15k (15,000 metres or 16,404 yards) - and yes, that's referring to how much yarn you use up during this time. The rules are super easy and flexible, to learn more about it all check out the Stash Dash thread on The Knit Girllls Ravelry group page here. And when I say easy and flexible, I mean stupidly easy and flexible. 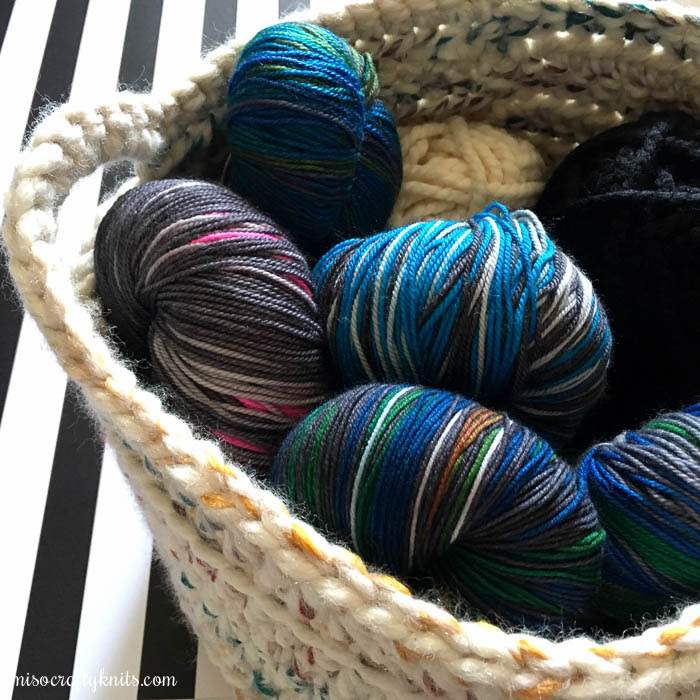 We're talking you can use any yarn that enters your house, even if it's during Stash Dash. You could have knit up a bunch of WIPs and then saved binding them all off for the start of Stash Dash and ALL that yarn that you used for them will STILL count. Heck, you can even rip back a few rows and then knit them back up and yes, all that yarn will still count too. Don't like the WIPs you're knitting? Casting on new projects during Stash Dash is A-OK too. And get this, this year you can count the total amount of yarn used if you hold it doubled! When it comes down to it, it's all about you and what you're comfortable with. You don't even have to make an official announcement as to which level you want to "compete" in until the last minute, just in case you have no idea what level you really can achieve. I just might be in that category. While I would love to attempt the 7k, the 5k seems more do-able, yet my hands may only want to do the 3k. My plan is to wait a few day before Stash Dash ends before I post my "finish line" level. ➳ Knit something that will eat up all 988m (1080yds) of the Patons Classic Wool Roving that has been languishing in my stash since 2010 but can't seem to give away. There are more WIPs that I'd like to finish for the Dash, such as my Exploration Station and possibly the almost 5-year old Dahlia cardigan, but I don't want to put too much pressure on myself and most importantly, my hands. So I'll play it by ear. And so it begins...ready, set, DASH!! Are you participating in Stash Dash? What's your goal? You have good & reasonable goals!! I have joined in the last couple of years & been able to achieve the maximum meterage, but this year might be different as I will be installing a new kitchen in the middle of stash dash. So I have reassesed & will go through my oldest stash & try use those & count the balls/skeins used as well as finish some of my 64(!!!!) wips!!!! Good luck to you! !